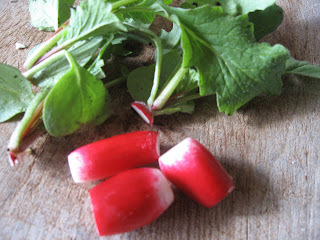 Well here they are at last - Today I pulled my first radishes of 2010, in fact my first summer salad veg of the season ! These were grown in well manured soil in the polytunnel, in between new rows of Cambridge strawberries (I'm after an early delicious crop). 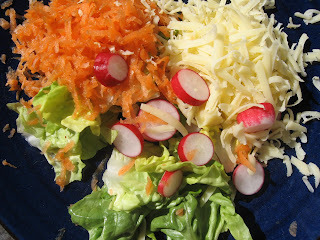 Below is today's organic lunch (or was as I have eaten it all about 2 hours ago). I'm afraid only the radishes were from my garden.